I haven't made a post in a very long time! This is mainly due to how busy I have been. Finally though, I have had some time to continue work on the half scale house. This week I finished off the porch and added some iron lace to cap the tower and the bay windows. I added supports to create a gently sloping porch roof. I then finished off the porch supports and glued them in place. I glued the porch posts to the porch roof separately from the house in one unit, so that when I pain the house it will be easier. To finish off the exterior of the house, I wanted some decorative iron work. This is a picture of the roof line of a victorian house, with decorative iron lace. I designed a lace pattern myself using Adobe Illustrator, and had the pattern laser cut in 1mm card. I then capped the tower and two bay windows with the lace. The house is coming along nicely. Next I will be doing the shingling and making a chimney. Then I will be moving on to the interior! Slow and steady wins the race..
votre maison est une merveille, je suis en admiration devant votre travail si minutieux. Quelle belle réalisation!! votre maison a beaucoup de caractère!! Very impressive, especially the ironwork on the tower. This is a nice project to follow. I cannot believe how you have transformed this kit. It is amazing! One day I hope to be as good as you are. You really know how to kit bash a beautiful house! Increíbles las terminaciones imitando la forja. Fantástico. Hi Emily! I think everyone has been very busy this summer....:D! I think that you are busy making of a master piece out of this kit, this house looks fabulous! It looks so beautiful with the iron lace and fretwork around the porch, just like so many real houses! When the roof is done, it will be really hard to tell its not real. I really love how your house is progressing and all you attention to detail is well worth the effort. You should be very proud of your work. Great work! Love all the detals! Very clever to do the ironwork to your own design - I would love to have done something similar with my first Fairfield. For my second one I want to make lots of changes so I will keep that in mind. You are doing such a lovely, detailed job of this house - it is beautiful. I've been m.i.a blogwise this year and will have to go back and follow your journey from the beginning. Looking forward to watching your progress. 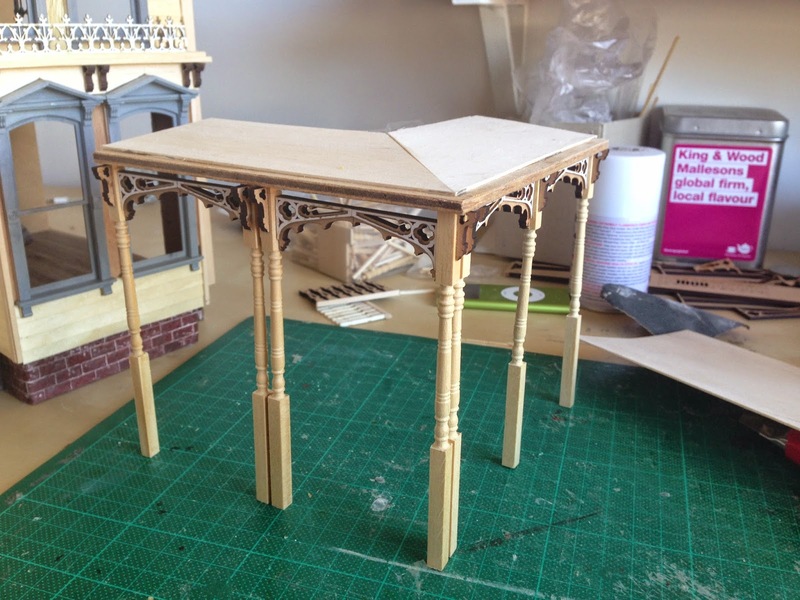 That is so stunning Emily, I love the design you made for the fretwork, the house is going to be fabulous with all your additional touches. Amazing, by far the most impressive Fairfield i have ever scene. So impressed that you designed all your own detail work! !